The IO360° team at the Conference Forum to collaborate for the first time with the Trout Group on the 4th Annual Immuno-Oncology 360° Summit and IO360° TroutTalks KOL Series. 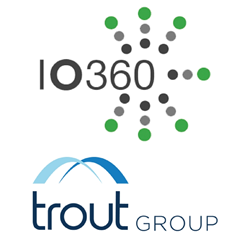 The Conference Forum and The Trout Group will collaborate for the first time on Immuno-Oncology 360° (IO360°) programming through a series of upcoming panels and events. The partnership culminates with the 4th Annual IO360° summit, to be held February 7-9, 2018, at The Roosevelt Hotel in New York City. “With our experience in producing the Immuno-Oncology 360° NYC event and The Trout Group’s expertise in investor relations, this is an exciting opportunity for us to work together on building IO programming specifically for the investor community,” said Kate Woda, Director, Immuno-Oncology 360°. Day one and day two of IO360° have sessions covering business aspects and investor relations for the immuno-oncology community. Dr Andrew Baum, Head of Global Healthcare; Managing Director, Equity Research, Citi, will deliver a keynote evaluating and forecasting the IO space. Additionally, Dr Bruce Booth of Atlas Venture will discuss the venture capitalist perspective, and GSK’s Dr Axel Hoos will moderate an investor roundtable. Designed by lead advisors Dr Axel Hoos and Dr James Gulley, National Cancer Institute, the IO360° summit provides the most up-to-date research, data and progress to help IO stakeholders. Expanding on the IO360° summit’s programming, a series of IO360° TroutTalks have been created as part of the ongoing TroutTalks Key Opinion Leaders (KOL) Series, which features conversations with prominent and up-and-coming researchers who are driving scientific innovation. The first of these IO360° panels is on August 17, 2017 at The Trout Group’s annual Hamptons CEO Roundtable. Another panel will be held in January 2018 at J.P. Morgan's Healthcare Conference in San Francisco. Panelists will be KOLs and IO industry experts addressing the most pressing topics and new research in the field. Learn more about the Immuno-Oncology 360° summit. The Trout Group is a global investor relations and strategic advisory firm. Since 1996, Trout has been a leading strategic partner to the life sciences industry, connecting companies, the capital markets and innovations in the sector. Trout's unique suite of services at the intersection of scientific advances and a network of institutional relationships creates long-term value for stakeholders. To find out more about The Trout Group, contact Thomas Hoffmann, Managing Director, at thoffmann(at)troutgroup(dot)com or call 646-378-2931. The Conference Forum is a research firm that develops specialized events for professionals in the life science and healthcare industries. The company currently offers conferences for R&D leaders, clinical development professionals, biotech executives, VCs, drug delivery specialists, patient advocates and non-profit/government healthcare groups. The Conference Forum’s mission is to create the best content, facilitate the exchange ideas and provide quality networking to help move therapeutics to patients faster.